Tucson history begins around 10,000 B.C. with the migrations of Paleoindian and Archaic hunters and gatherers. Tucson is located in the Southern part of Arizona in the Southwest United States. Tucson is one of the oldest continually inhabited locations in North America. Hohokam Indians are a key part of Tucson history and farmed here for 4,000 years before Spanish missionaries and soldiers came in the later part of the 1600s. Tucson sits in a Sonoran Desert valley that is surrounded by 5 mountain ranges. Interestingly, the trip from the 2,389-foot valley floor to the 9,157-foot Mt. Lemmon peak traverses seven of the earth’s nine life zones. To put that in perspective, that is the same as driving from Mexico to Canada. Tucson is surrounded by the natural landscapes of the Coronado National Forest, Catalina State Park, Ironwood Forest National Monument, and Saguaro National Park. Hohokam Tribes Inhabit The Area Around 200 A.D. Between A.D. 200 and 1450 period of Tucson history, the Hohokam tribes flourished. Todays Pima and Tohono O’odham cultures are the descendants of that society. They have lived in the region since the Hohokam decline. Tucson history indicates that around 1540 the Coronado Expedition crosses Arizona in search of the “7 Cities of Gold.” Father Francisco Kino establishes the Mission San Xavier del Bac in 1699. The large structure wasn’t completed be until 1797, almost 100 years later. The mission has been a focus for Tucson history since that time. The history of Tucson includes the Mission San Agustin. Mission San Augstin, a “visita” of San Xavier, was established on the western bank of the Santa Cruz River in 1757. 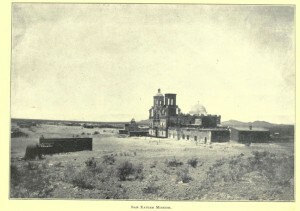 The mission and the monastery were completed in 1790’s. Around 1775, Hugo O’Conor establishes the Tucson Presido. This year is recognized as the formal birth date of the City of Tucson. Tucson becomes part of Mexico during Mexico’s fight for independence from Spain in 1821. Eventually the town was named “Tucsón” and was part of the Mexican state of Occidente. Upon its gaining independence from Spain, Occidente later became know as Sonora about 1830. Mormon soldiers came along the San Pedro River, north of Tucson, around 1846. The Mormon soldiers fought the “Battle of the Bulls” during this point in Tucson history. This was actually a skirmish between the soldiers and wild cattle roaming the area. The engagement resulted in 2 soldiers being injured and a large number of pounds of fresh meat for the soldiers. On December 16, 1846, the Mormon soldiers marched into Tucson. The small Mexican garrison of Fort Tucson, promptly fled without conflict. Tucson history records a brief occupation by the Mormon soldiers before they continued their procession to the Pacific. The Gadsden Purchase by the United States in 1854 is a key date in Tucson history. With out it, Tucson may still be part of Mexico. On that date, Tucson came under the jurisdiction of the United States. A few years later, Arizona becomes an official territory in 1863. Between 1867 and 1877, Tucson was the capitol of the Arizona territory. In 1880, the Southern Pacific Railroad reaches Tucson and the migration of people from the eastern cities to the Southwest began in earnest. Tucson history shows the population of Tucson at this time was about 8,000. In 1885, the University of Arizona, was founded as a land-grant college on over-grazed ranch land between Tucson and Fort Lowell. This is also the time of Wyatt Earp and the Earp brothers being in Tombstone. The fight at the OK Coral has been a topic of TV shows and movies for many years. In 1912, Arizona becomes the 48th state in the Union. By 1950 Tucson’s population has reached 120,000. Just 10 years later, it nearly doubled to 220,000. In 2012 the population of the Tucson greater metropolitan area stands at 992,000. If your are thinking of the Tucson area as a place to live or as a future place to retire, we can help.